I am in the mood for sewing. It relaxes me so. The time is what I am short on these days. I’m in skirt or funky apron mood. I’ll just have to make time!!!!!! Beautiful fabrics, so nice and fresh. I would love to have some of your fabric! but living in New Zealand, it might be too expensive to ship. Your dresses for little girls are so pretty and I still plan to buy the birthday lantern pattern one day too! 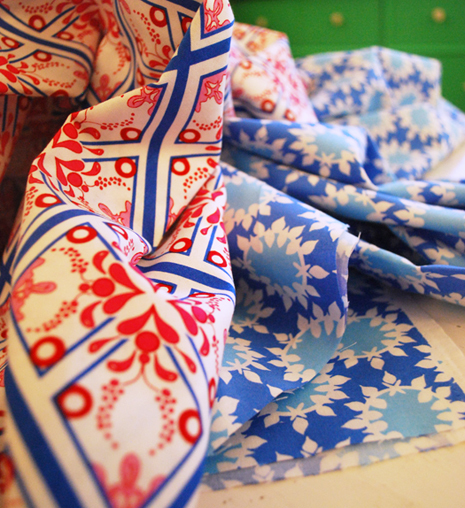 For Christmas Bekah made me a reversible table runner with her fabric….it’s so pretty! Does it fit the entire length of your table, Nancy? That’d be over eight yards! I am in the hospitAl with a blood clot in my lung, such pretty fabric.sure would lift my spirits. I would like to win it.I can see a pretty skirt already! My wife would love to receive it, it would be a nice surprise because she would like to color and pattern. I made stockings for my whole crew this Christmas and I’ve got some of Bekah’s fabric on mine. So fun! Fabric is beautiful! Lovely blue. I would have to make something special with this. Is the giveaway over? Did I miss it? I just discovered this blog — beautiful, gracious, God-honoring living. Thanks! To folks who are posting here, the contest is actually over at Bekah’s blog. Follow the link in the post to Amoretti.